Why? 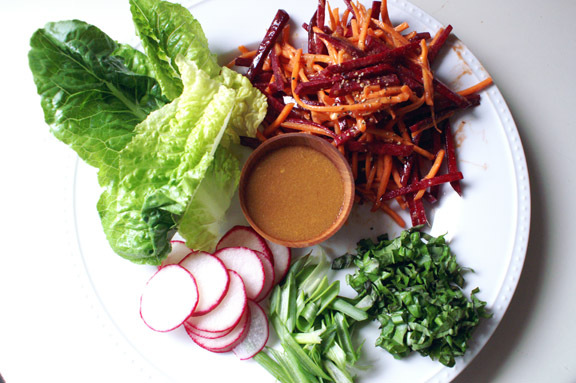 Because this salad is worth it. Because summer is the perfect time to try new things, or revisit things maybe you’ve tried a few times and think about occasionally. 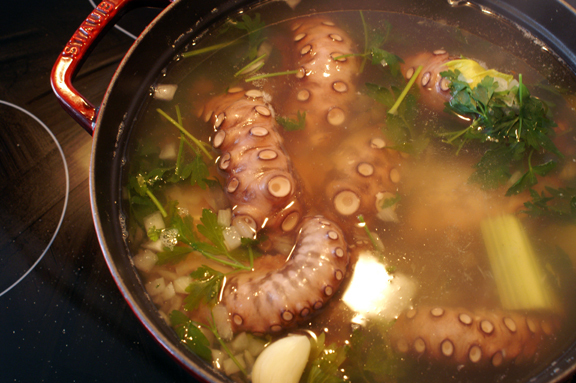 I’ve never cooked octopus before; I’ve eaten it several times, and loved it, but it always seemed rather daunting. I’m here to tell you it’s not: if you can get past the defrosting, that is, because it’s the worst. You can find octopus in most any asian or international market (STL: head to Global Foods, middle freezer section), neatly frozen into cubes; no big deal, right? Right! Until you thaw them. This takes forever in the refrigerator – unsurprising, considering the shape. It dawns on me at some point that this method isn’t cutting it (although it’s a great head start), so I head to the sink to do a nice cold-water bath to get it the rest of the way there. People, I am not a squeamish person. Seriously; I have no gag reflex and can basically touch, smell, or eat anything without freaking out, which is clearly why I have this gig. Maybe you are that way too, and maybe you’ve handled baby squid before and been like “OMG so cute!” and that’s great, you. Fist bumps. 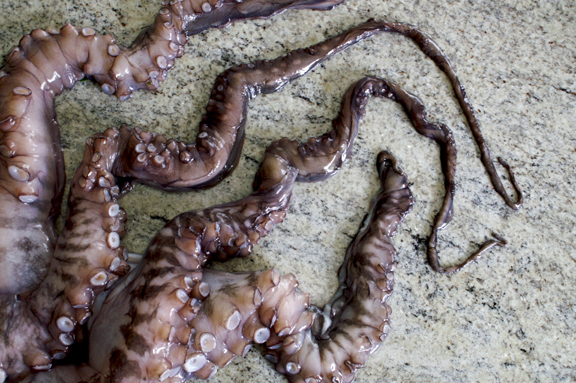 But here’s what: when you’re dealing with a large, raw, slowly defrosting octopus, that gag reflex – and all your horror-movie nerves – will be tested. No horror – just a cube of frozen octopus, no big deal! Maybe you’ve thawed it in the fridge, so it’s little soft on the outside, but nothing you can’t handle, Braveheart. It’s just a sea creature, right? No problem. Level 2 horror – that octopus that you know is dead just moved like a live octopus. Did anyone else see that? Level 4-5 horror – The legs are slowly unfurling and here’s the head the head is visible and there’s a beak in there somewhere DEAR LORD IS ANYONE ELSE SEEING THIS. It’s not alive…it’s not alive…is it alive? Level 7 horror – Seriously now the head is up and the legs are all squirmy and you’ve heard of cryogenics where it’s maybe possible to freeze some thing that’s still alive when it thaws. You are convinced that is exactly what’s happening in your sink. You back away. You know it’s stupid, but you back away. Plateau, Level 7 horror – you stare at it like an idiot for an undetermined amount of time. Level 8 horror – it dawns on you that you have to go back in and touch it. All you can think about its beak and that it’s maybe still alive and also all those sea-creature horror movies you’ve seen, and how smart you know octopuses are they are so smart. Plateau, Level 8 horror – you get the longest spoon you have…just to poke it. Just to make sure. Just to not die. You are convinced – even though it sounds crazy – that it’s about to jump out of the sink and adhere itself to your face. Level 9 horror – You poke it. a few times. Level 4 horror – it’s probably not alive or out for revenge. You can do this. Perhaps. Horror subsides – You make all the octopus. 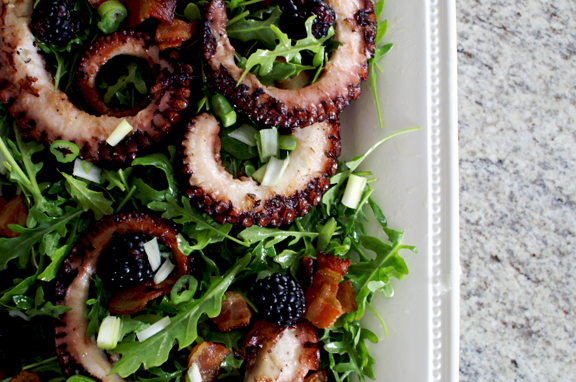 Now that you know the possible levels of horror you’ll experience, why not go right ahead and buy yourself a big octopus and make my delicious salad? Or anything else, really: octopus is pretty amazing; succulent and light and a total treat that can hold its own in pretty much anything. It’s tough, so start with my braising recipe (alter it as you see fit; you can braise it in any liquid with any herbs combo you want to suit your needs) and then go from there. I like a char on mine: it caramelizes the outsides and gives it a smoky flavor – always a plus, in my opinion. It can handle sauces rather well, and my next venture with this is a curry, I think. I owe you a roundup of Feast columns, because I haven’t posted them in a few months due to the move and getting settled. They’re out there, obviously, but expect that soon. 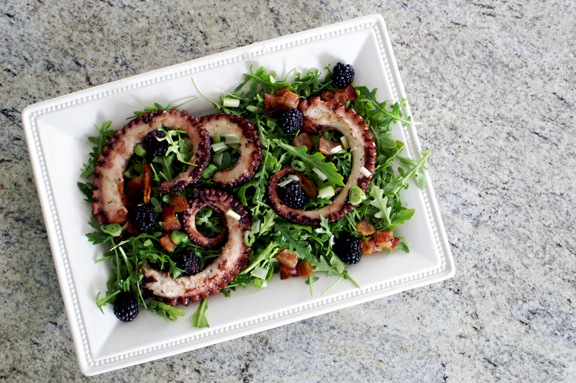 If you’d like the recipe for my (not scary anymore) octopus salad, head right this way, please. 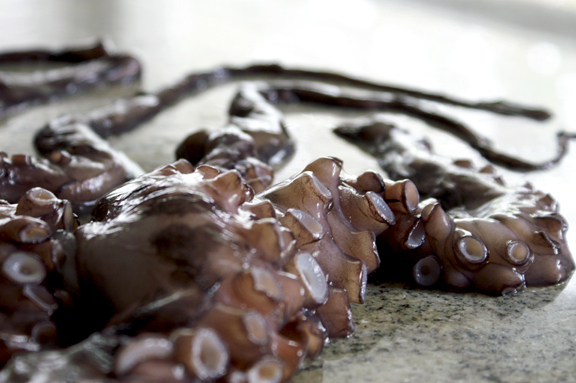 Jon Gayman, you did a fantastic job of bringing my octopus to life in your photographs; thank you for that. If you want to see what I’ve been doing with the column these past few months, head over here or sit tight and I’ll round them up for you. 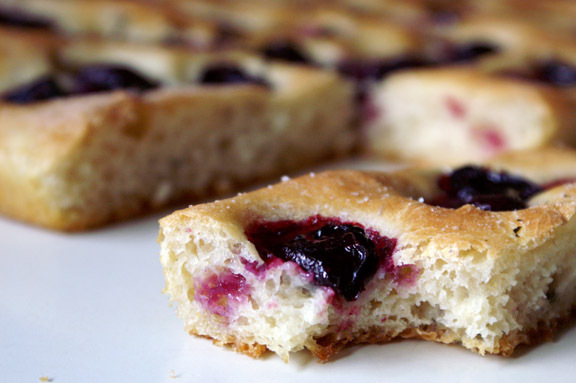 Recipe, folks! Right over here. Refer to my horror guide above if needed. LOL! Fun read. When I was a tad we used to buy squid to use for bait when fishing at the Jersey shore, so this isn’t one of those things that causes a gag reflex for me. What does cause a gag reflex is squid/octopus that is supposed to be cooked for awhile, but hasn’t been cooked enough — so it’s rubbery and tough. Not my cup of tea — you really do have to braise this properly. Anyway, good stuff — thanks. Bwah! Truthfully I prefer squid and cuttlefish to octopus–there’s something so…disconcerting about eating something with suckers on it, plus I find it tough no matter what one does to it. Needless to say, I highly enjoyed your walk through the nine circles of horror (and I totally imagined you fashioning an extra-long poking stick like they made on Friends to poke the Ugly Naked Guy to see if he had, in fact, perished). You know what, Elizabeth? You were going to be my One Person Who Liked Octopus here, but I can’t say I blame you (at all!) for not being a super big fan – the suckers are…yeah. they’re there, and toughness is evidently quite commonplace. I completely understand. HAHAHAHA YES!!! I had completely forgotten about that Friends episode, but that nailed it. The stupidest thing about it is that I’d do it again, and you’d think now i’d just be prepared for the horror movie movement, but if there is a next time, i’ll assume that THAT is indeed the one that will kill me. So. HA! I love it! 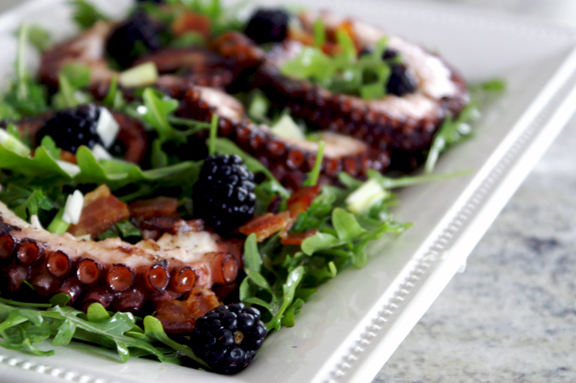 Well, not octopus, so much (I’m not a big seafood eater despite wanting to do so for years…). But your real-time progression of octopus thawing horror is EXACTLY how I would feel (if I had the guts to even deal with octopus in my kitchen). I would think about how smart they are and how maybe, just maybe it is alive and if it is, it will totally attach itself to my face because that is the only place it would go. Poking it with a very long spoon (I might’ve gone broom handle wrapped in plastic wrap, just to be safe) is definitely the way to be safe and sure. You, lady, are crazy awesome and crazy brave and totally hilarious! A surprisingly low number of you like octopus; I’m not mad at you for it. 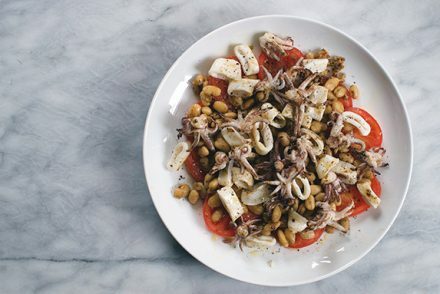 🙂 At least you’re giving seafood a go – it’s not for everyone, and i’ve been amazed at how many people really shy away from seafood in general. I didn’t grow up in a house that made fish all the time, but we made enough for me to think of it like chicken or whatever…nothing more. I’m happy to hear that you’d have had the same reservations, shall we say, about Mr. Octopus here. Had i known he would UNFURL as he did in my sink, well…would have made a video. Next time, just for you guys. 🙂 Thanks, lady. I’ll put my mother in charge of this sort of thing. She has no qualms and no gag reflex. Just adding this to the list of reasons I love Rosie.